Will you be one of the hundreds of millions of football fans around the globe watching the FIFA World Cup in Brazil this month? If so, I bet you'll be playing your slots while you watch! 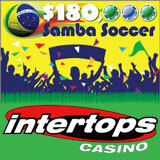 Play at Intertops Casino during the $180,000 Samba Soccer casino bonuses as giveaway this month and win your share of $30,000 in weekly cash prizes. Predict World Cup winners and you can win even more! Last week Intertops also launched a new football-themed slot game called Football Frenzy. Until June 25, get an up to $100 casino bonus to try it by entering coupon code FRENZY when you deposit. You'll earn points when you play online casino games at Intertops and you'll be ranked on a Scoreboard. Top scoring players win up to $500 each. This month players that can predict World Cup winners in Brazil will receive extra casino bonuses. Make it to the final leaderboard and correctly guess the winner of the July 13th World Cup Final Match and win a $50 BONUS. Votes must be cast from July 10th to July 13th. The top 20 on the leaderboard during each week of the promotion will be included in a draw for two $1000 cash prizes. Players who correctly guessed the winner of the World Cup Final match qualify first.